Besides his bat and his arm, he was just as well known for his mouth. Teammate Jim Brosnan thought Bailey’s nickname, “Gar,” stood for “garrulous.”2 (It stood for Edgar.) Cincinnati writer Earl Lawson said, “For sheer brashness and cockiness, there has been no big-leaguer to top him since the days of Dizzy Dean.”3 After baseball Bailey did what came naturally: He went into politics. Lonas Edgar Bailey Jr. was born on April 15, 1931, in Strawberry Plains, a small east Tennessee community just outside Knoxville, one of six children of Lonas Edgar Bailey and the former Edna Floyd Cox. His father ran a general store, but the family lived on a farm. Ed and his four brothers milked cows, hunted, fished, and played ball together. At 14 he was big enough to pass for 16 and talked his way into a tryout camp. A Pittsburgh scout took him to Salisbury, North Carolina, to work out with the Pirates’ Class D farm club. After a few days, the boy confessed his lie and went home. More scouts got interested when Ed became an all-state catcher at Rush Strong High School, where he also made all-state in basketball. Instead of signing a professional contract, he went along with his parents’ wishes and accepted a basketball scholarship to the University of Tennessee in Knoxville. He was on the verge of flunking out in his sophomore year, so baseball looked like a better bet. At least a dozen major league teams were after him. He spurned the Yankees — Berra had just made his second All-Star team at age 24 — and signed with the Cincinnati Reds in November 1949 for a bonus reported to be as much as $35,000. The 19-year-old hit .313 in his first professional season, in Class C ball, and was back with the Reds the next spring. Manager Luke Sewell said, “Bailey has everything you look for in a catcher, plus a world of savvy.”6 Bailey had one more thing: his draft notice. He spent the next two years playing ball for the army at Fort Jackson, South Carolina. When Bailey returned in March 1953, the team had a new manager, Rogers Hornsby, and a new nickname, Redlegs, in response to the Red Scare then polluting the country. At 23 Bailey had grown to 6-foot-1 and around 200 pounds. He went 5-for-5 with two home runs in an early exhibition game, but was sent down for more seasoning. After joining the Double-A Tulsa club, he took four days off in May to marry his college girlfriend, Betty Lou Carr. He hit just .243 with Tulsa, but slugged 21 home runs and showed an outstanding batting eye with a .352 on-base percentage. The Redlegs called him up for a look in September. He doubled in his first major league at-bat and went 3-for-5. The next day he came down to earth; Warren Spahn struck him out twice and held him hitless. He was Cincinnati’s catcher of the future, but it took him awhile to get there. In 1954 he spelled veteran Andy Seminick, playing almost exclusively against right-handed pitching, but batted only .197. He didn’t lose his swagger. Frustrated by spending most of his time on the bench, before one road trip he asked manager Birdie Tebbetts, “Shall I bring my catcher’s mitt with me?”7 Tebbetts, a talkative former catcher, took a liking to him and tutored him on catching and throwing. Bailey opened the 1955 season as the regular, but was batting under .200 in May when the Redlegs acquired catcher Smoky Burgess. Tebbetts sent Bailey back to the minors, urging him to stop swinging for the fences. He hit 16 home runs in the Pacific Coast League with a .282 average. Bailey thought winter ball was a turning point. Taking Tebbetts’s advice, he was among the Venezuelan league’s leading hitters. But Smoky Burgess hit even better, and he did it in the National League, batting .306/.373/.499 with 20 homers. Since Burgess was also a left-handed batter, there was no room for a platoon. Bailey was not likely to take Burgess’s job, even though Burgess’s defense and arm were no match for his. Bailey did win the job when Burgess, and the Redlegs, got off to a slow start. And he ran with it. He turned in his career year in 1956, hitting over .400 for the first month and leading the league in batting average at midseason. He was elected to start the All-Star Game. A flood of votes from Cincinnati fans elected five Redlegs, a portent of trouble ahead. Cincinnati finished third while winning 91 games, riding a powerful lineup that tied the 1947 Giants’ major league record of 221 home runs. Five players hit more than 20, led by rookie Frank Robinson’s 38, Wally Post’s 36, and Ted Kluszewski’s 35. Bailey contributed 28 homers, including three in one game, while playing only 105 full games with a .300/.385/.551 batting line. It was a good year for the Bailey family; that spring Cincinnati signed Ed’s 21-year-old brother Jim, a left-handed pitcher. Although the Redlegs slipped to 80 victories in 1957, Cincinnati fans proved to be too dedicated for their own good. They stuffed the ballot boxes for the All-Star Game, aided by local newspapers that printed ballots with the names of hometown players already filled in. A few weeks before the game, every player in the Redlegs’ regular lineup was leading in the voting. The Cincinnati front office urged fans to vote for the revered Stan Musial at first base instead of their own George Crowe. Commissioner Ford Frick intervened and named Musial, Hank Aaron, and Willie Mays as starters along with five Redlegs, including Bailey. Fans lost the right to vote for All-Stars for more than a decade. Bailey’s 1956 season proved to be a fluke. For the next four years he batted no better than .264, and his power numbers declined. He was just about an average hitter. Burgess continued to get some at-bats and turned into a feared pinch-hitter, but Bailey’s superior defense kept him in the lineup. Every year there were rumors that one or the other would be traded for some badly needed pitching. 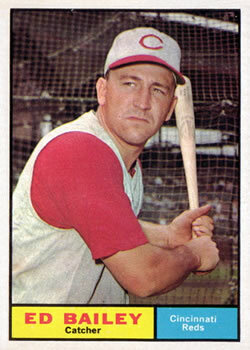 Finally Burgess, who was four years older, was swapped to Pittsburgh in January 1959. The highlight of Bailey’s 1959 season was his brother’s major league debut. Jim (called “Hop” at home because of his middle name, Hopkins) was a September call-up after four minor league seasons. The Bailey brother battery didn’t impress the Chicago Cubs. In Jim’s first game, he gave up a home run to the third Cub he faced. The Redlegs staked him to a lead in the fifth when Ed’s bases-loaded lineout bought home the go-ahead run, but Jim gave the run back in the bottom half. The rookie blew up in the eighth, allowing three more runs to take the loss in his only decision. He pitched twice more in relief, then broke his throwing arm the next spring and never returned to the majors. The Reds, as they were again called, hired a new general manager, Bill DeWitt, in December 1960. He promised an overhaul of the sixth-place team, but said he wouldn’t trade Bailey because he had no catcher to replace him. The 1961 season had barely begun when DeWitt changed his mind. He shipped Bailey to the San Francisco Giants in a deal for the second baseman he needed, Don Blasingame. But DeWitt had been right; he had no one to replace Bailey even after the trade brought a younger backstop, Bob Schmidt. Schmidt batted .129, and the Reds’ catchers combined for a .201 average. It didn’t matter; Cincinnati shocked the league by winning its first pennant in 21 years. Bailey was also shocked to be traded away from the club that had signed him when he was 18. “It’s a funny feeling, you know?” he told teammates.9 His wife had just arrived in Cincinnati as he was leaving for San Francisco. The Giants’ superstar, Willie Mays, had carried on a bantering rivalry with Bailey for years — Bailey daring Mays to try to steal and Mays promising to do just that. Bailey usually won bragging rights; he once threw out Mays three times in a single game. But he appeared to have left his arm in Cincinnati. After shooting down almost half of base stealers throughout his career, he nabbed just 30 percent in his first year in San Francisco. Giants pitchers must deserve a big share of the blame. Bailey was a disappointment to the Giants. His batting average slipped to .238, and he managed only 13 home runs. The club tried out two young catchers, Tom Haller and John Orsino. After being traded away from a pennant winner in 1961, Bailey got his chance the next year. By the second half of the 1962 season he was sharing the job with Haller, who also batted left-handed. Bailey started 65 games to Haller’s 83 and hit 17 homers to Haller’s 18. Combined, they drove in 100 runs, giving the Giants All-Star level performance behind the plate. Despite his .232 batting average, Bailey thought it was one of his most productive years. He went 6-for-18 as a pinch-hitter with three pinch home runs, one a grand slam. Bailey’s only hit in his only World Series was a ninth-inning home run that saved the Giants from being shut out in Game Three. San Francisco lost to the Yankees in seven. At 32, Bailey put up another All-Star season in 1963. He hit 21 home runs in just 308 at-bats while sharing the catching with Haller. After the season the Giants traded him to Milwaukee in a seven-player deal that brought them pitching depth and a former All-Star catcher, Del Crandall, who was even older than Bailey. Crandall, a right-handed batter, gave the Giants a platoon partner for Haller. The Braves split the catching duties between Bailey and 23-year-old Joe Torre, who also played first base and turned in his first big year, batting .321/.365/.498. But Bailey’s power disappeared; he hit only five homers. The Braves sent him back to San Francisco after the 1964 season for reliever Billy O’Dell. Bailey’s second tour with the Giants lasted only until May, when he was traded to the Cubs. He took over as the regular catcher and had one last hurrah on July 22. He went 4-for-4 with two homers, one a grand slam, and drove in eight runs. But his arm was gone. He needed cortisone shots in his elbow and threw out less than one of four base stealers. Chicago passed him on to the California Angels in January 1966, and the Angels released him in May. He went home to Knoxville for a public-relations job with a trash-hauling company, then joined the staff of Republican Congressman John Duncan. Working out of Duncan’s district office as a field representative, Bailey dealt with constituent problems and served as the congressman’s eyes and ears. After a dozen years of glad-handing voters for Duncan, Bailey did the same on his own behalf. He won election to the city council in 1983 and held his seat for another dozen years. One of his four sons, Joe, succeeded him. Bailey died of throat cancer at 75 on March 23, 2007. 1 Earl Lawson, “Baseball’s Cockiest Star,” Saturday Evening Post, May 24, 1958, 25. 2 Jim Brosnan, Pennant Race (New York: Harper and Brothers, 1962), 29. 4 “Adcock Given Chance to Display His Wares in Role of Fly Chaser,” Cincinnati Enquirer, March 17, 1949: 20. 5 Lou Smith, “Sparks Off Lou Smith’s Forge,” Enquirer, April 6, 1949: 20. 6 Smith, “Reds’ Hill Staff as Good as Any in Loop, Sewell Says,” Enquirer, March 4, 1951: 61. 7 Unidentified clipping in Bailey’s file at the National Baseball Hall of Fame library, Cooperstown, New York. 8 Jules Tygiel, Baseball’s Great Experiment (New York: Vantage, 1984), 304, 351. 10 “Playoff Pearls,” The Sporting News, October 13, 1962: 10. 11 Bill Ballew, “Ex-Big Leaguer Ed Bailey Profiled,” Sports Collectors Digest, October 8, 1983: 161. 12 Darren Dunlap, “Recalling Ed Bailey’s ‘exciting life,’” knoxnews.com, March 26, 2007, accessed June 23, 2016.